Sham Singh Attariwala, was born in 1790's in the house of well known Sikh farmers in the town of Attari (Few kms from the border of Indian and Pakistan punjab in India). At his early he was educated in Gurmukhi and Persian. When Ranjit Singh became maharaja of Punjab he got himself at his disposal. Ranjit Singh knowing his qualities and fighting abilities made him a jathedar of 5000 horsemen. He participated actively in many campaigns, notably like the campaign of Multan, campaign of Kashmir, Campaign of the frontier province. For a brief period of 3 years Maharaja Ranjit Singh made him governor of Kashmir. Later, Maharaja Ranjit Singh recalled him to Lahore, since he was trusted aide of Maharaja Ranjit Singh, Maharaja feared treacherous dogras. It is said that Sham Singh Attari and Maharaja Ranjit Singh were good friends. Sham Singh Attari could be called truly, one of the unofficial ministers of Ranjit Singh's court. Later, he educated himself to read and write English. Lord William Bentick's meeting with Maharaja Ranjit Singh at Ropar, on the bank of the Sutlej, in the spring of 1831 October 15 was an occasion of an impressive ceremony and display. Both sides met on the either side of Satluj with their full forces. Sham Singh Attariwala was in the forefront everywhere. 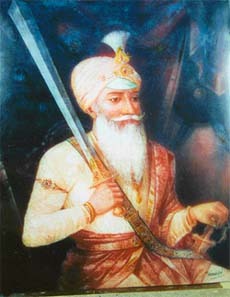 Kharak Singh was declared the heir apparent of Maharaja Ranjit Singh. Kharak Singh's son Nau Nihal Singh was sixteen years old in 1837 when Sham Singh Attariwala proposed the marriage of his daughter to Nau Nihal Singh, grandson of Maharaja Ranjit Singh. Maharaja agreed. Marriage was held at Amritsar in the month of April. It was a gala event. Almost all the rulers of India were invited as well as those of Kabul, Iran, etc. The two days of festive and merriment is still remembered by the people of Amritsar and Lahore. In honor of Nau Nihal Singh's wedding, Ranjit Singh started an Order of Merit that was known as Kaukab-i-Iqbal-i-Punjab, star of the Prosperity of Punjab. But... all was not well. Maharaja Ranjit Singh died in June 1839. The powerful Dogras from Jammu, Gulab Singh Dhian Singh and Suchet Singh- played a subtle role and put into motion a chain of proceedings which brought about the demolition of Sikh power. At the time of Sikh ruler's death. Dhian Singh was Prime Minister of Punjab to Kharak Singh, son of Ranjit Singh. Gulab Singh and Suchet singh also held offices under Dhian Singh dogra. They were not content with this. They had their eyes on the throne itself and the main object of their grand strategy was to crown Dhian Singh's son, Hira Singh, king of the Punjab. One night, Suchet singh led his men into Maharaja Kharak Singh's chamber and killed his trusted aide and tutor, Chet Singh Bajwa. Kharak singh was removed from the Fort and remained virtually prisoner in the hands of Dhian Singh. Sham Singh Attariwala and other good officers were sent to far places like Kashmir, northwest frontier provinces, just like Nau Nihal Singh. Nau Nihal Singh knew about the treacherous dogras. He did not come to Lahore until the day his father Kharak Singh, died due to slow poisoning by Dogra brothers. On the same day of his father's cremation, a huge concrete piece fell on Nau Nihal Singh and he also died. It is said that Dogra brothers hatched this conspiracy. English doctor of Lahore that operated on prince, later reported that prince was alive and wells after injury but mysteriously next day his skull was found crushed. Dhian Singh then openly suggested Maharani Chand Kaur to adopt his son and declare him Maharaja of Punjab, she refused and was put in house arrest. The maidservants also killed her. Gulab Singh carried away all the money and valuables belonging to Maharani. Then the next Maharaja other son of Ranjit Singh, Maharaja Sher Singh was put to death by the Sandhawalia sardars, they were together with Dogra brothers. English saw the opportunity and they attacked. Sham Singh Attariwala, who was more of a soldier than a politician., got the troops together. But he was not assigned the general, rather a small number of horsemen was put under his command. Generals like Lal Singh and Tej Singh led the Khalsa forces. They did not attacked British at Ludhiana but waited until their reinforcement arrived from Delhi. On December 13, 1845 Governor General Lord Hardinge issued a proclamation, announcing war on the Sikhs. Lal Singh, the Prime Minister of Sikhs was in treasonable communication with Captain Peter Nicholson, the Assistant Political agent. He advised Lal Singh too not to attack Ferozepur Sikhs could have won it easily. Sikhs came into contact with British on December 18 1845 at Mudki, a Battle took place. Lal Singh who headed the Sikh attack, deserted his army and precipitately fled the field when Sikhs stood firm in their order fighting in a resolute and determined manner. The commander's action disturbed the ranks and Sikhs retired with the loss of 17 guns, British suffered heavy casualties of 872 dead. Among the dead was General Robert Sale, the defender of Jalalabad. Sham Singh Attariwala did not took part in this action he was deployed at another point. The second battle of Mudki was fought and it seemed that Sikhs had won it easily. Here is what the British commander in chief acknowledged "We were in critical and perilous stage". But Lal singh and Tej Singh came again to the rescue of the English. They both deserted the Khalsa army, Sikh soldiery without their leaders was stood waiting for orders and lost the battle once ammunition was done. In this battle British lost 1000 men 1721 were wounded, Sikhs lost about 2000 men and about 73 pieces of guns. Sikh Sardars were alarmed. A Sikh Sardar named Ranjodh Singh Majithia crossed the Satluj in full force along with another Sardar named Ajit Singh Ladwa. They marched to Ludhiana and burned down the British cantonment. Sir Henry Smith who was sent to intercept them was defeated at Baddowal on January 11. Then the last battle of the Anglo Sikh wars was fought at Sobharaon. It was do or die for the Sikh Sardars like Ranjodh Singh, Ajit Singh and Sham Singh Attariwala. Sham Singh Attariwala who was about 60 years of age vowed before Guru Granth Sahib to fight unto the last in battle rather than retire in defeat. But... Lal Singh and Tej Singh had already given British their positions of guns, etc. Gulab Singh Dogra stopped sending rations from Lahore. Tej Singh fled on the very first day of the action. Sham Singh and Ranjodh Singh led the forces. Sham Singh Attariwala clad in white silks and riding a white steed, the gray bearded hero went unto the field of action, pledged to victory or death. He rallied the ranks depleted by traitorous desertions. His courage inspired the Sikhs to make a determined bid to save the day, but the odds were against them. Sham Singh fell fighting in the foremost ranks. So did his dauntless comrades. Cunningham, who was present as an additional aid-de-camp to the governor-general, describes the last scenes of battle vividly in his book History of the Sikhs: "...although assailed on either side by squadrons of horse and battalions of foot, no Sikh offered to submit and no disciple of Guru Gobind Singh asked for quarter. They everywhere showed a front to the victors, and stalked slowly and sullenly away, while many rushed singly forth to meet assured death by contending with a multitude. The victors looked with stolid wonderment upon indomitable courage of the vanquished..."